If there is a tiny little bit of space left on your webspace and you got that one sub-domain left to use, you should definitely take a look at MonstaFTP, a brand-new, free PHP script. MonstaFTP, released as Open Source under a GPL license, lets you access FTP servers comfortably from right inside your browser. In combination with Chrome you can even upload whole folder structures via drag & drop. Generally, all modern browsers are supported. MonstaFTP had me already two weeks ago, when I ran into it during my research for fresh and crispy content. Since that day, MonstaFTP has not moved from my side and accompanies wherever I happen to have an internet connection. MonstaFTP is a PHP script, nowadays called cloud-app, that provides a fully functional FTP client with not much missing, at least not for me and my projects. Installation as well as daily use are a snap. I would go as far as to call it intuitive, given you already have some experiences with FTP clients. Installation is done simply by uploading the contents of the downloaded ZIP onto your webspace. I chose to install MonstaFTP under a sub-domain, but this was just for my own convenience. You need not do that, MonstaFTP works from any folder that’s reachable via an URL. Configuration is done entirely from inside the index.php. In my case I did not need to change anything. MonstaFTP supports localization, yet comes only with US English translation. It is easy to extend these possibilities though. The folder languages contains a file named en_US.php. Open it with the editor of your choice and see how easy it is to change the few snippets. Once done, rename the file to e.g. de_DE.php or whatever language you translated it to and re-upload the file. If you need to connect to FTP locations that reside outside the server where MonstaFTP is installed you might need to change a server setting to allow external FTP connections. If you are running into trouble, ask your hoster for help. MonstaFTP is able to connect to Windows-servers, yet needs to be running under a Linux OS itself. Given the reach of Linux as basis for web hosting, this should not mean a limitation to almost anybody. 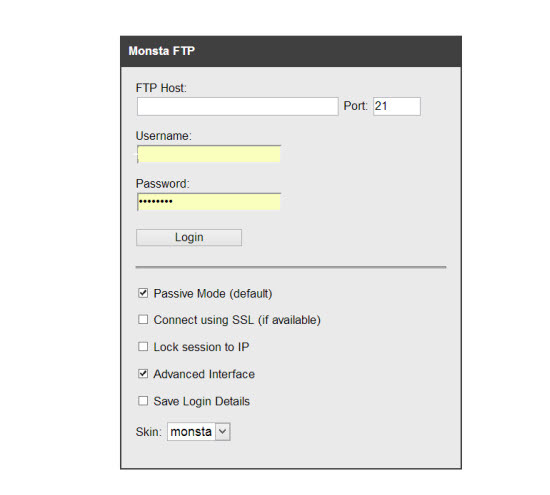 MonstaFTP is able to use secure connections via SSL. If you like variety in design, choose between two standard skins, one an elegant gray, the other a Metro-resembling blue. Log-in credentials don’t get stored in MonstaFTP, but must be entered at each new connect..
MonstaFTP performs best in Chrome. 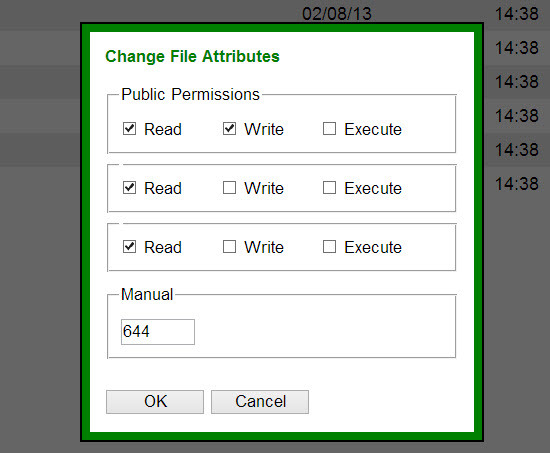 Here you can even upload folders per drag and drop. Uploading files individually however also works from the other supported browsers, as there are Firefox, Safari and Internet Explorer. MonstaFTP follows the flat design trend and does look exceptionally good in the surroundings of the new Windows UI. If you are a digital nomad, MonstaFTP is something you will want to check out. Use it and be able to connect to your projects from wherever you are able to establish an internet connection. The cloud app is my premier choice of FTP client under Windows 8, on Mac OS I stick to my Transmit – for the time being. You can download the script from your favorite directory, such as Hot Scripts or directly via MonstaApps. They do ask for an email address, yet you can deny to enter one. If you enter one, you’ll be kept updated on new apps by the Monsta team. I am convinced and put my thumbs up. What do you say? thank you was looking for something like this..
“pop”! Your content is excellent but with pics and videos, this blog could certainly be one of the very best in its field. Pingback: Hosting und Webspace für Jedermann! By downloading the file type PNG (bronze), there is a problem with its opening. Simply changing the content, ie the header and then he or she can not open it the browser.